Ever since I graduated from university, I always had a vision of being my own boss. I just don’t like the idea of someone bossing me around, plus I’m a take charge kind of person. That idea made me realize that in order to establish a professional career on my own and at the lowest cost possible, I ought to work from home. I started taking on freelance jobs and working from the comfort of my own bedroom, and then the days went by. I got married, had a kid, and realized that having an office is out of question in the near future. 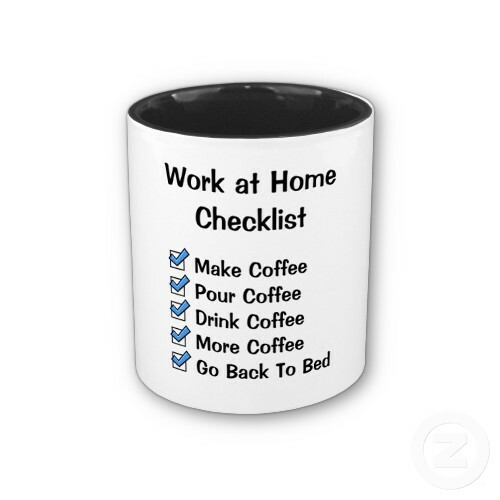 Now, more than ever, I love working from home, especially in this freezing weather! The only concern I have every morning is to decide whether to have a cup of hot cocoa or coffee beside my laptop! 1- I am my own boss. 2- I can work in my PJs. I can even work while in bed under my blanket for that matter! This means that I don’t have to wear shoes either. 3- I can take a break anytime I please. 4- I don’t have to deal with grumpy-in-the-morning colleagues. 5- I can stay up as late as I want. 6- I can take the day off if I want to. 7- I can work on holidays if I have nothing to do or nowhere to go if I feel like it. 8- I can put on music as loud as I want. 9- I have my own office. 10- The kitchen is only a few meters away and I don’t have to worry about munching on crappy fast food or fatty and sugary snacks found in vending machines! If you work from home, do you have other reasons why you love it? I’d like of you to share them with us! After I retired, I started working free-lance, and off-site. I wouldn’t have liked to come back to the office. Working at home has all the advantages listed in the original post – flexible hours, one is one’s own boss, total independence (except of course you have to mind the deadlines, and the required volume of work (number of pages translated per day). Some people miss the social interaction, but I don’t. Working at something I like doing, and doing it at my own pace, is really the best of both worlds. Do not forget the huge advantage of, not to drive from home to office and vice versa in the busy traffic thus to avoid from being traffic-depressed! You’re absolutely right, Dr. Mehmet! One downside I have recently experienced is that you can take on too much (Oh, I can fit that in tonight or in the weekend) and become overworked until your body starts to protest. I ‘m taking a break now and then I’m going to be more selective in what I do or do not accept and scrap some types of work altogether (such as proofreading). I would add that you can choose who you want to see and interact with more. Saving on clothes and transportation is a plus (if your freelancing does not make you too much poorer than a job). Working when it suits you also means that you can be sick or under th weather and still be working without added stress. And what about the way you work? No one to oblige you to use a paricular revision tool, etc. Yes : pretty awsome. I love to be a freelancer translator and interpreter, but I have always combined this job with another that allows me to interact more with people. By the way, Tina, would you mind explaining why you are not going to accept proofreading projects? Is proofreading too demanding, or not very well paid…? It’s just curiosity. I am thinking of starting proofreading, but now I am not so sure… Thanks! @Eva: I am past retirement age, and my body has let me know me that I need to slow down. I plan to concentrate more on interesting and well-paying projects in my specializations. Proofreading, which in my case often involves similar documents with the same types of errors every time, I’m beginning to find very boring and it pays less than half of my translation rate. That is one area I feel I can drop. But if you are younger and fairly early on in your translation career, there is no reason why you shouldn’t do it. It is a good learning tool because it sharpens your attention, it often requires a bit of editing as well, and in terms of money, every little bit helps doesn’t it. Absolutely agree with all of the above comments plus being able to stop and take a break for an hour or so by going to my basement and working out on our elliptical and home gym. Awesome!